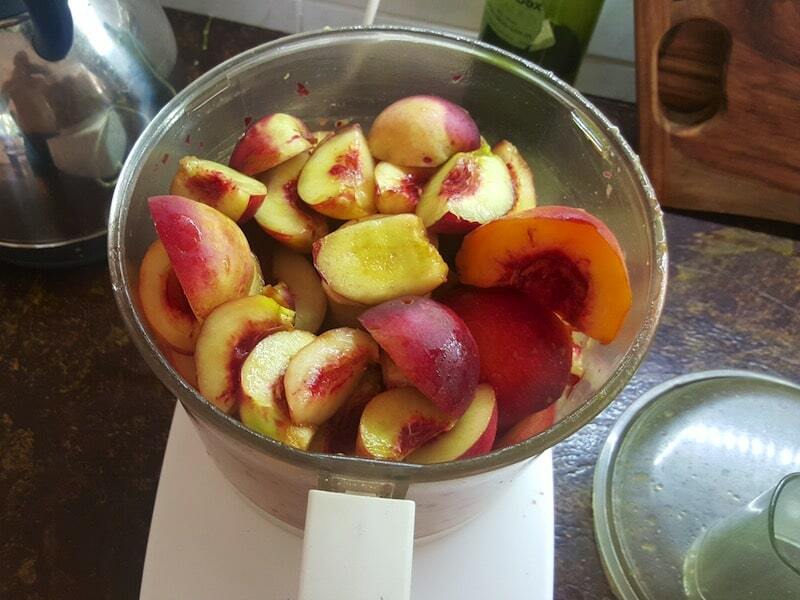 What do you do when you’re short on time and the many boxes of home grown nectarines you’ve been gifted are all about to go mushy? 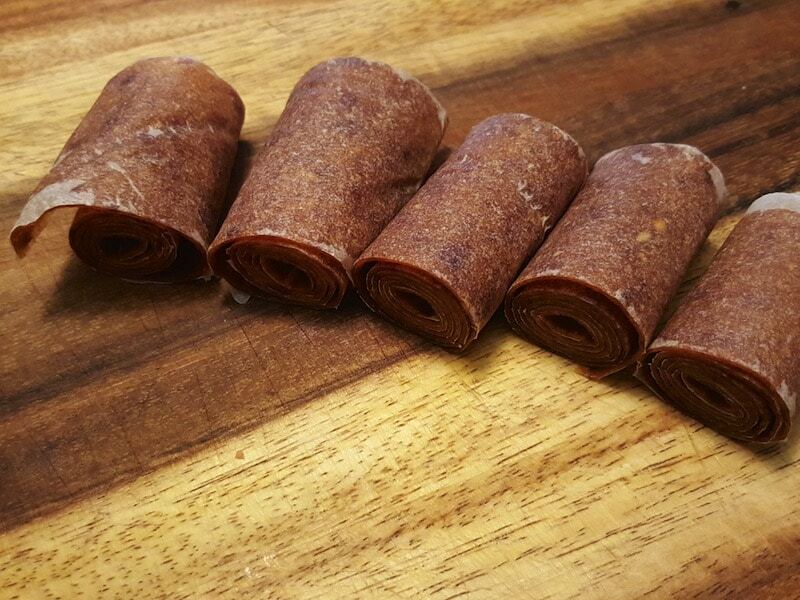 DIY fruit leather roll ups to the rescue, that’s what. We made these with nectarines that came (in quantity) from Nick’s parents trees (thanks Mum) but you could use whatever fruit, or combination thereof, that you like. 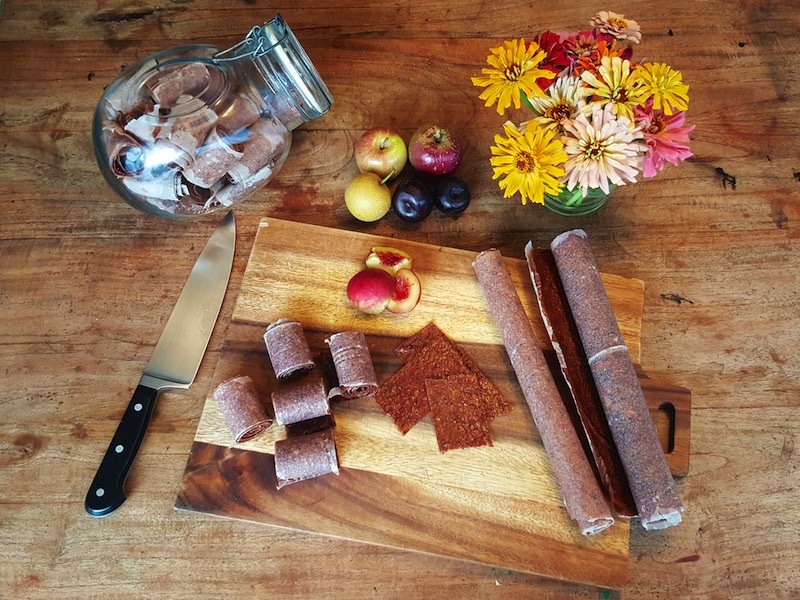 DIY fruit leather is a great was to store the not-so-perfect fruit in your life for later without having to boil it or add a bunch of sugar. Which on a very hot day, like this one was, seemed like just the thing to do. 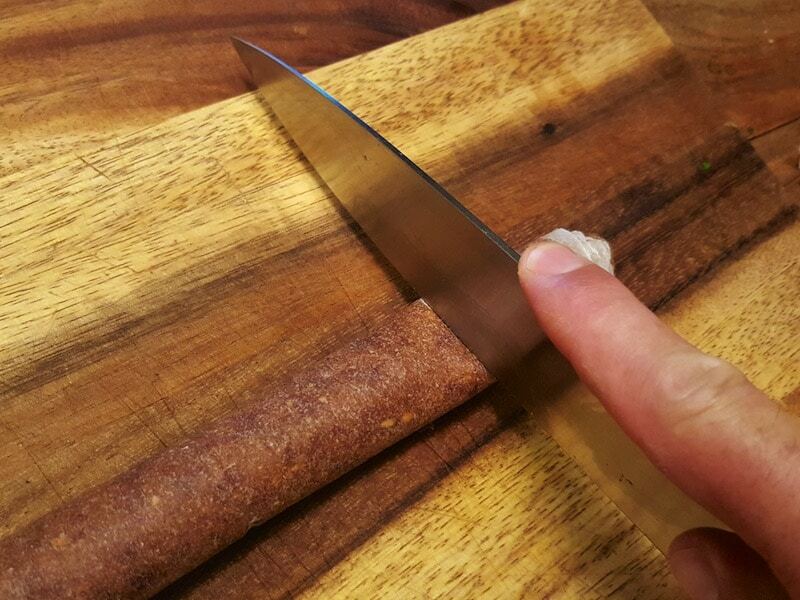 The process is almost embarrassingly simple – mush fruit, add a little honey, dry it out, roll it up. Though there are a few tricks along the way that we learned, which we will now share with you. Rightio. So, firstly, we washed and stoned the fruit, omitting the bad bits. Then, we put in in our food processor, load by load, until it was all well smushed. 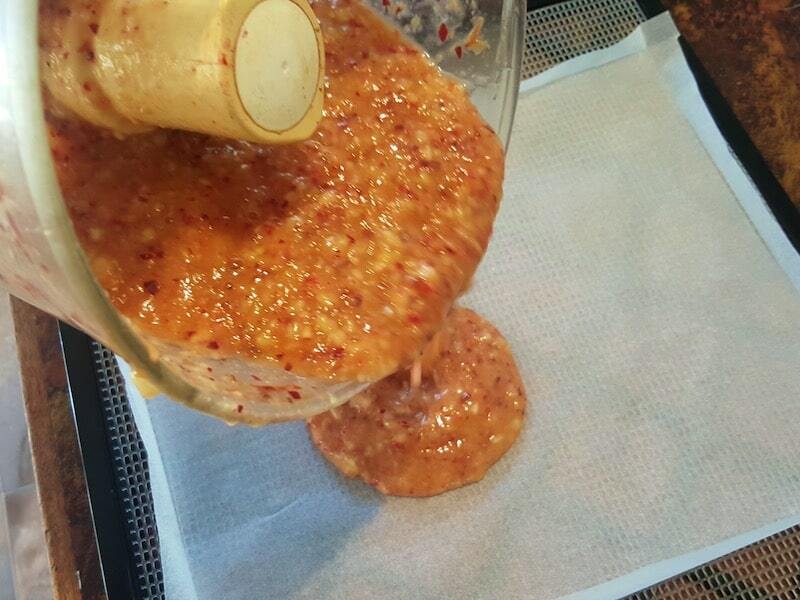 Then we stirred in a bit of honey, for added awesomeness. Now, the baking paper. Obviously you want the fruit mush to stay on it, and not drip off. This is a thing. 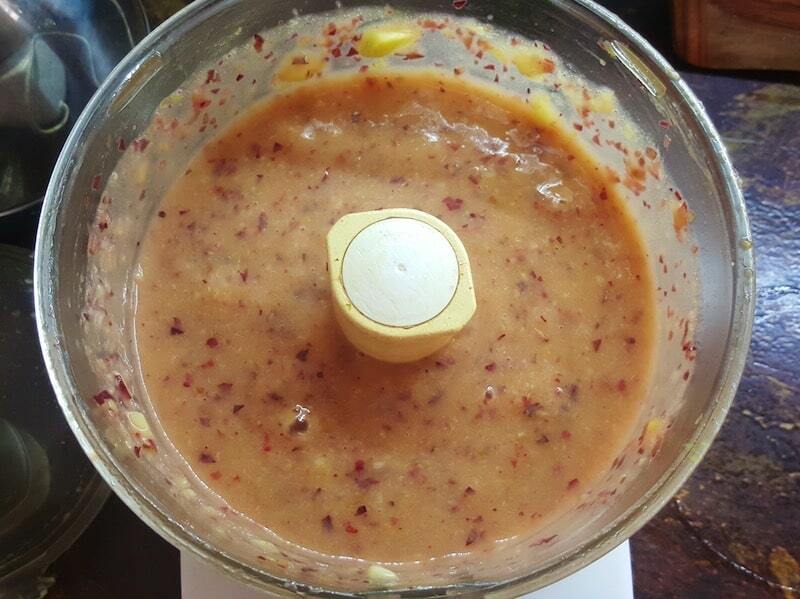 When making your fruit mush, if it is particularly watery, you might want to consider adding banana or something to thicken it up. We didn’t have that problem here though. Nick the resident engineer folded up the edges to create a small lip, to guard against spillage. This technique worked very well. This baling paper went on the trays of our dehydrator. 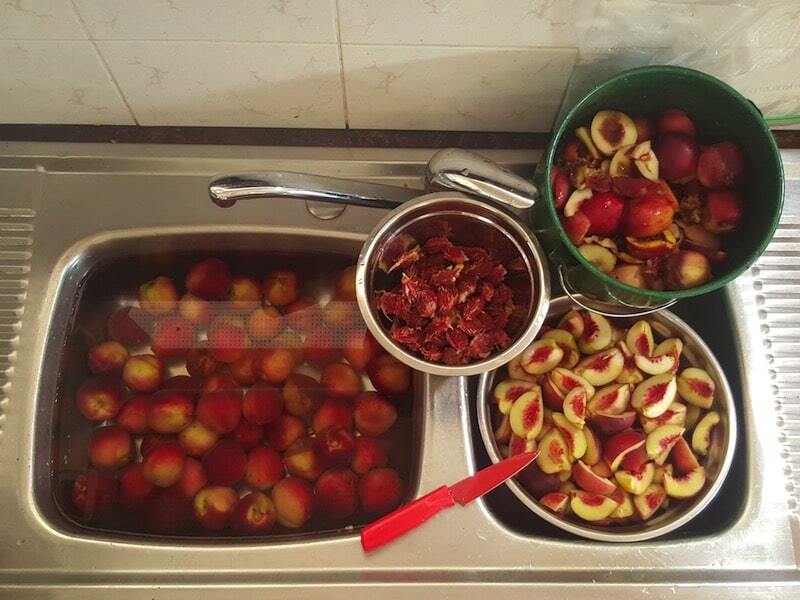 We poured on the nectarines to about a 4mm thickness, and then put them in the dehydrator. 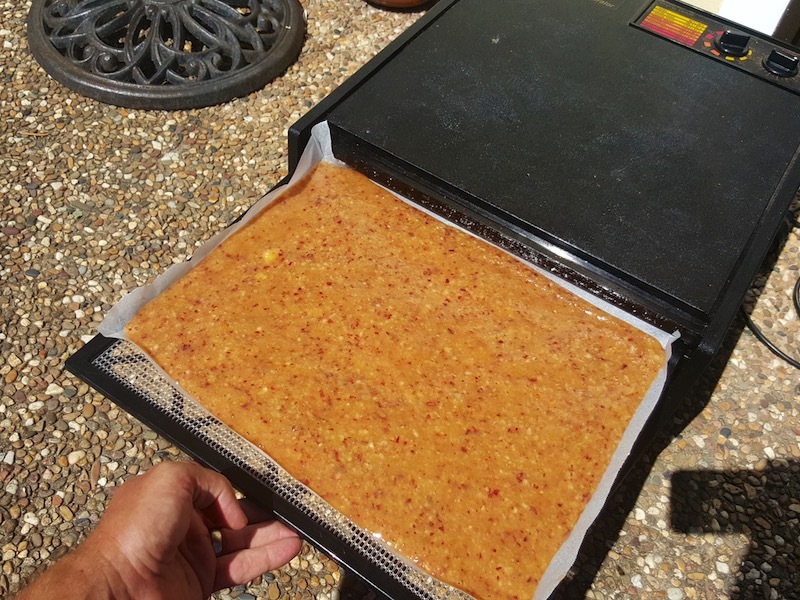 Use the energy you’ve got – this was a hot day, so we put the dehydrator outside, figuring it wouldn’t have to work so hard to maintain a constant temperature of 57ºc. 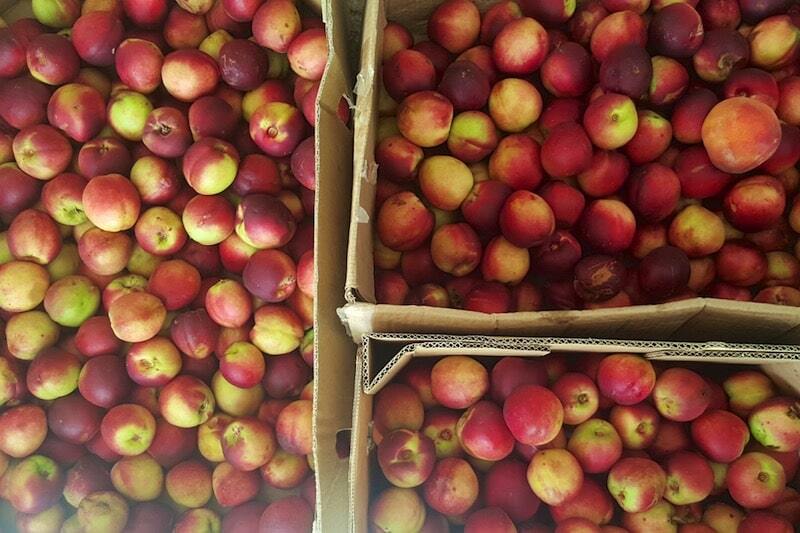 How long this takes will depend on the water content of the fruit – these took about 18 hours – so they were drying outside all afternoon and then moved inside overnight. We woke up to a nectarine-scented house. 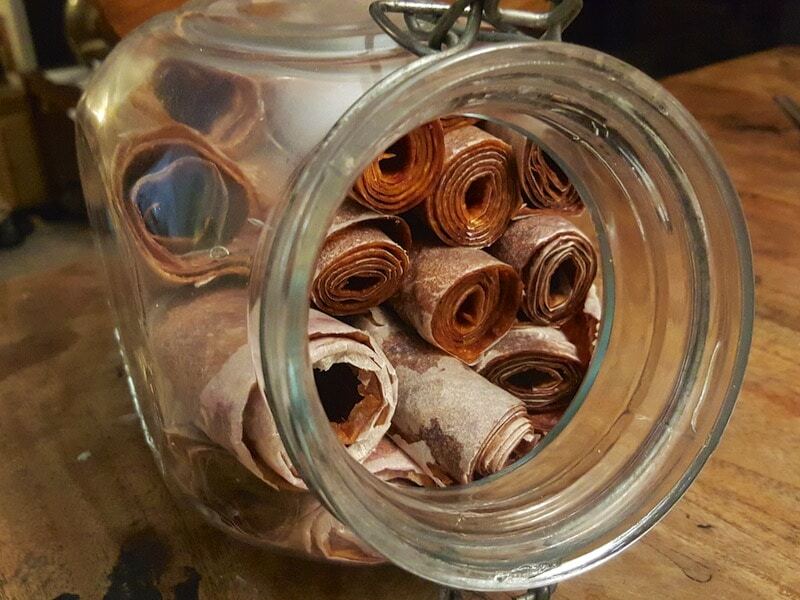 Once your roll ups are dry, you can roll them up! At this point, cutting them into manageable bits is a good idea. 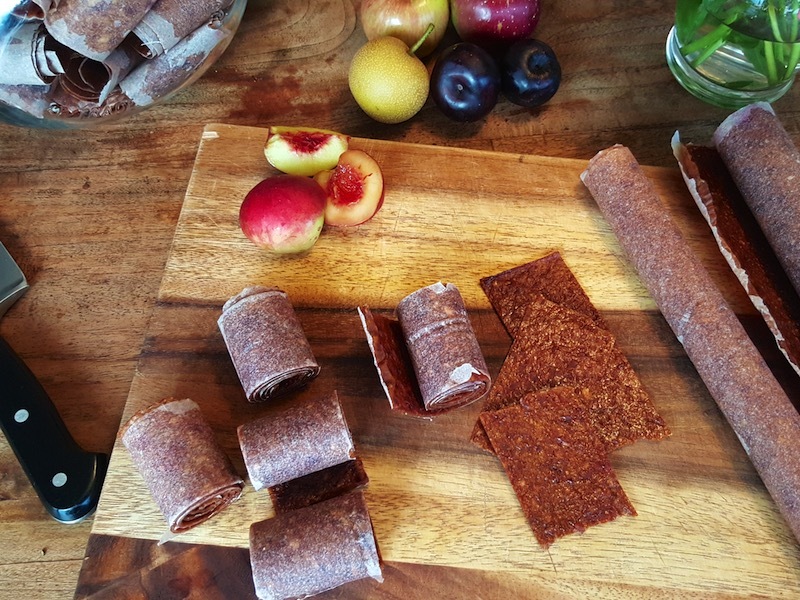 We found the fruit leathers to be quite tough (in a nice way) and so cutting through a whole roll required some muscles. 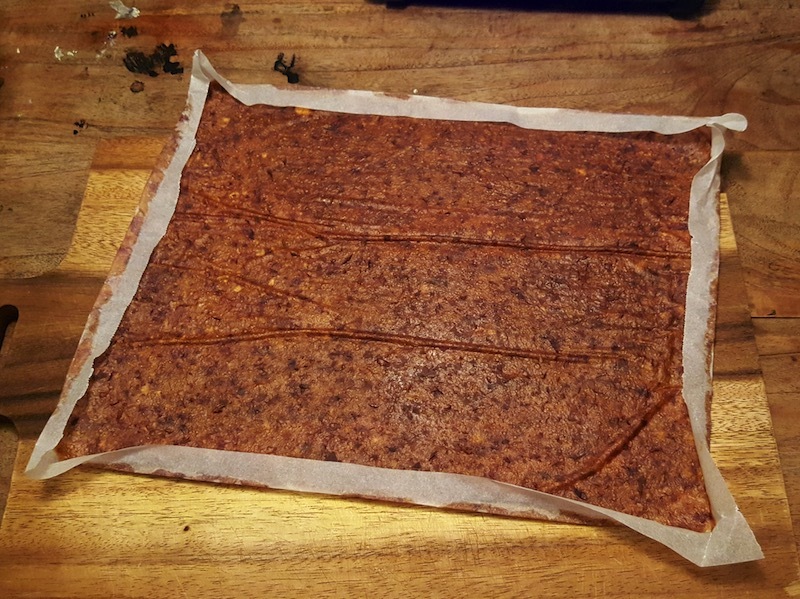 We chose to leave the baking paper on as this helps with un-rolling and breaking bits off later, without it sticking to itself – I’m not sure how you would go eating a wad of un-rollable fruit leather, but I think you would be chewing for quite some time. Once all that was done, we jarred them up and breathed a sigh of relief. Many many weeks of lunchbox snacks are now sorted. As someone who gets a bit overwhelmed in the height of ‘free fruit’ season, I can’t recommend this technique highly enough. The prep is minimal and the results are great. Plus you can do fruit combos if you have too many of multiple things. Wins all round. Happy squishing, rolling and eating to you. Too much fruit? 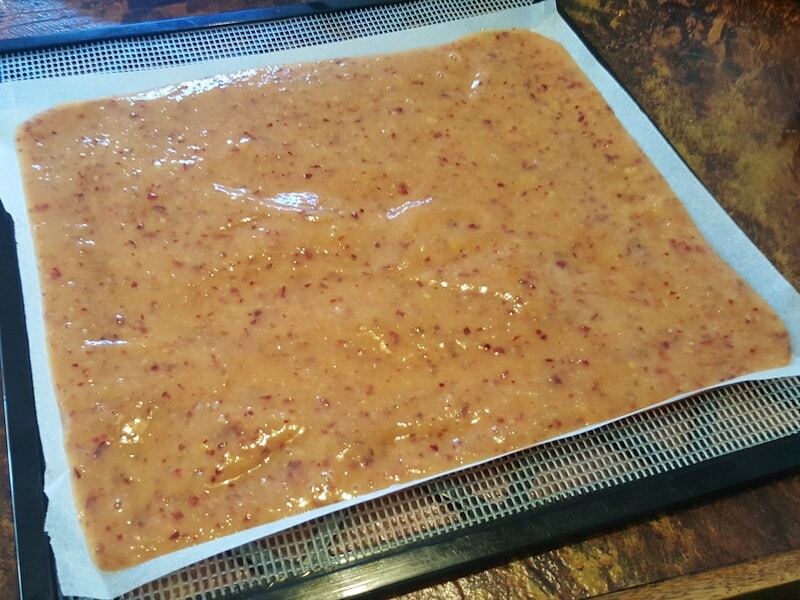 Process it all as above (the squishing bit) and then freeze it in batches, until the dehydrator is available. It defrosts fine, takes up far less space, and then off you go. 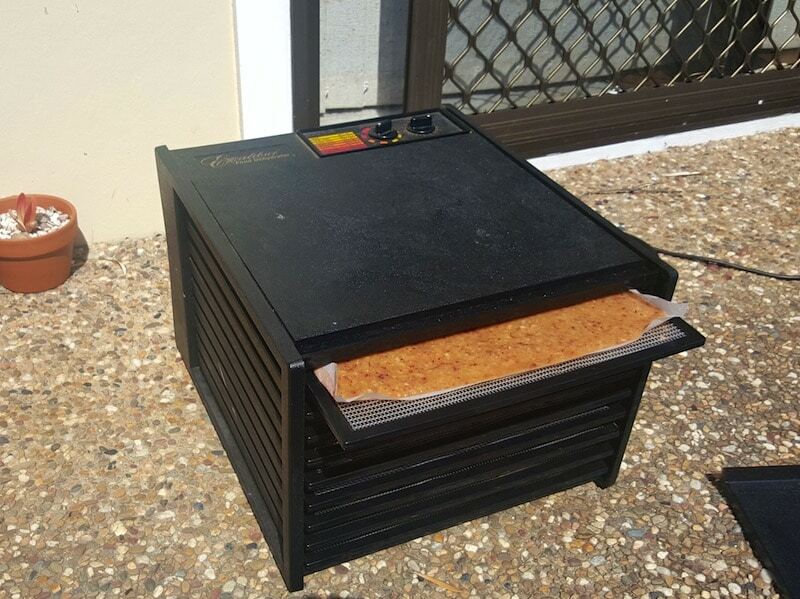 We use an Excalibur dehydrator that we’ve had for over 5 years, and it’s going strong. There’s now stainless steel and glass versions of it if you’re super anti plastic, but they’re more expensive. 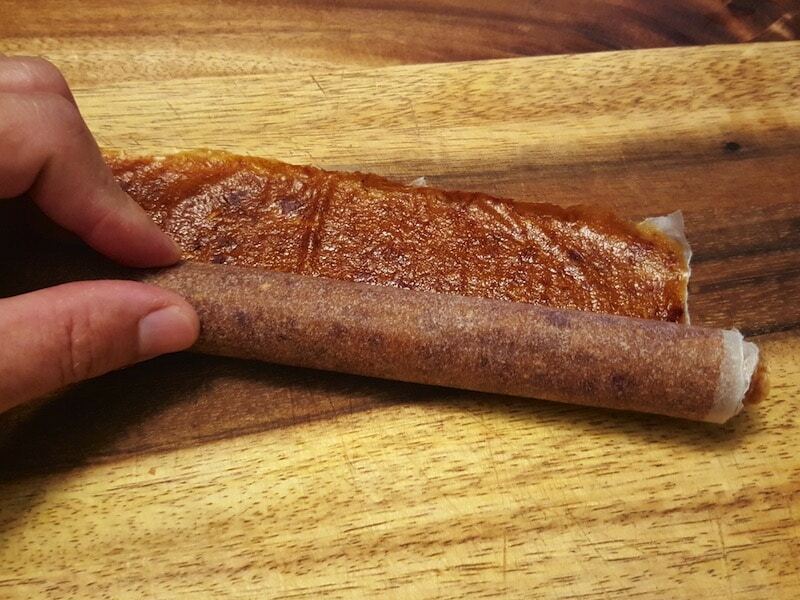 Here’s a list of recommended fruit leather fruits that i just found, but really, it’s pretty obvious. Watery is less good, thicker is more good. Mix it up, and add honey if you need to. 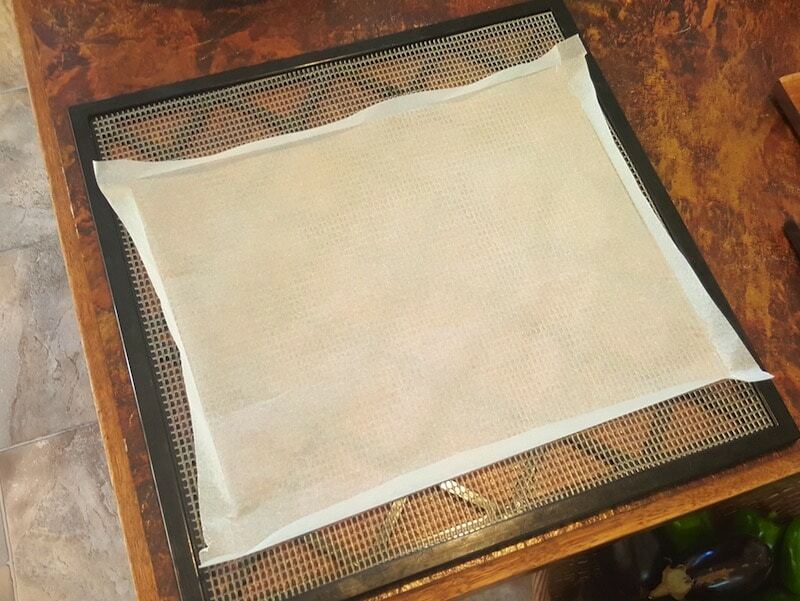 If you don’t want to use baking paper, there’s lots of drying sheets on the market. Excalibur sell a sheet called ‘Paraflexx’ but it’s non stick coating is made by DuPont (the makers of Teflon) so… yeah. 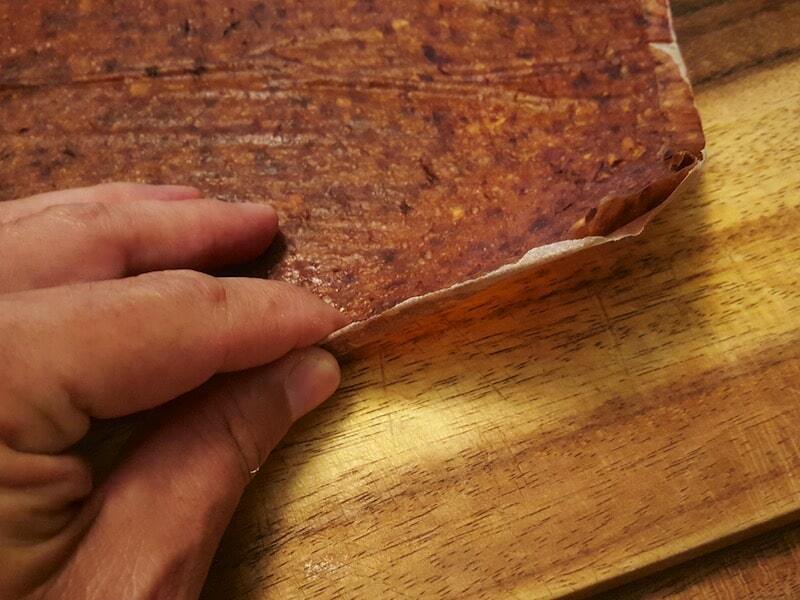 We’ll stick with baking paper till we figure out a better solution. 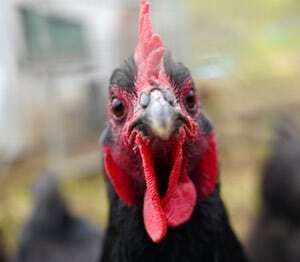 Our great-grandparents didn't have slow cookers to make their lif . .
Ah great, thanks for the tip! I wonder if they really work…I’m guessing a dehydrator like the Excalibur would just use too much power. I haven’t lived off grid before so I guess it’s all a bit of an experiment.